Building a small butterfly pond is an easy way to create a water source for a butterfly habitat or butterfly garden. Butterflies need water--not because they are thirsty but because there are minerals in water that butterflies need in the same way they need nectar for food. Creating a small butterfly pond or puddle will provide the minerals necessary for butterflies, as well as attract plenty of bright, fluttering visitors to your yard or garden year after year. Choose a sunny location for your butterfly pond, as this will attract more butterflies looking to warm themselves. Choose a relatively flat, level spot for the butterfly pond. Clear the area of rocks, twigs and weeds before digging. Dig a shallow hole that is four to six inches deep at the center. A good size for the hole is approximately 16 to 24 inches in circumference. Line the hole with the contractor’s trash bag or heavy black plastic. As an alternative, use a 55-gallon plastic trash barrel lid to line the hole. If you choose to use the lid, you will need to dig the hole to a size and depth to accommodate the lid. Pour a thick (two to four inches) layer of sand into the lined hole, then spread it around until it is even. Put a layer of river rocks and decorative rocks (optional) on top of the sand. Fill the butterfly pond with enough water to bring it even with the ground. Place plenty of large rocks sticking up out of the water for butterflies to land on. Butterflies prefer moist sand or mud as opposed to an actual body of water. 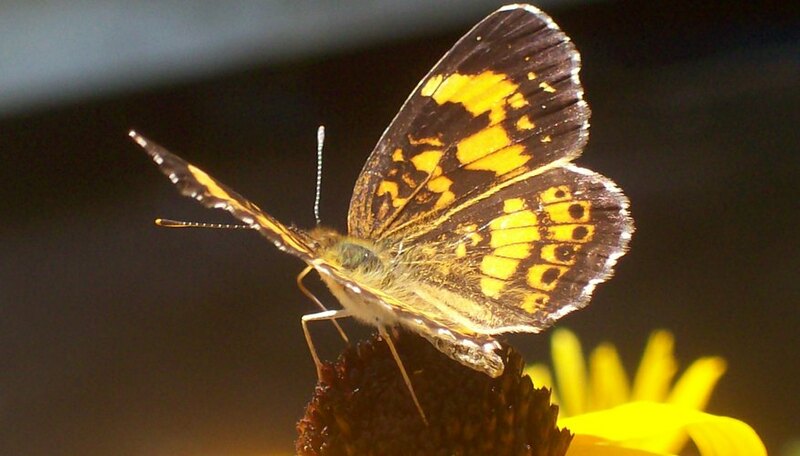 Plant perennial nectar plants like sedum, Shasta daisies, butterfly weed, black-eyed Susans, salvia and others around your butterfly pond to provide a food source for visiting butterflies. Add fresh water to your butterfly pond once or twice a week. Don't make the water too deep in the butterfly pond. Use just enough to keep the sand moist.